Let’s start by saying I read this in four hours. I hope this gives a good indication of how this review is going to go. Evie Brown is a normal teenager at the start of a long and boring summer waiting for her birthday. She doesn’t know that the next knock on the door is going to change her life. She is told that she has inherited £10 million, but at what cost? Soon Evie finds herself shipped off to Lightsea, an institute for troubled teens by those who love her most. Who can Evie turn to now? 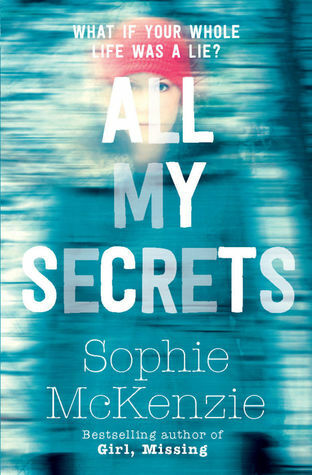 I’m a big fan of Sophie McKenzie, after reading her adult thriller Close My Eyes last year, it was one of the best twists I’d read in a while and so when I heard that All My Secrets was for YA I was instantly drawn to it. As I said earlier I read this in a matter of hours and as with her earlier novel McKenzie allows you to think you have it all worked out before throwing a spanner into the works. The novel really waves in and out giving the reader clues throughout making you question yourself at the end as to why you didn’t figure it out. I really liked the character of Evie and the journey she goes on through the novel, I didn’t see the first twist and now I find it brilliant. It is something that completely changes her world and how she see’s the people in it. While many would think, I’d take £10 million no matter what, I can assure you that this would make you think twice about it. As Evie delves more and more into the mysteries of Lightsea she has to consider who to trust or risk losing her life. I feel like Evie is very realistic in the way she handles the situation she is left in, she has her flaws and is not a seemingly perfect character. One of the few things that I got bored of quickly in the novel is the love interest that Evie has during her time at Lightsea, I understand teenagers will be teenagers but I really wanted to know more about the other young people. There are such interesting and vibrant characters created by McKenzie and I really wanted to know more about them as well as the island itself, which has been well described throughout. I’m going to give this 4 stars ****. This is the first of McKenzie’s YA novels that I’ve read and it was a great start. I love the fact that she has been able to seamlessly branch across genres. The reason I didn’t give this novel 5 stars is simply because I wanted to get to know the other characters better and see more of who they are and why they are also at Lightsea, their reasons are mentioned but quite quickly but not in detail.